Marathon in Distance. Ultra In Effort. 2020 is OPEN for registration with early price specials in effect. 2019 is sold out. 2020 is now open for registration and special early pricing is in effect. The 2019 Event is sold out. The Inca Trail Marathon to Machu Picchu Peru is an adventure marathon tour. 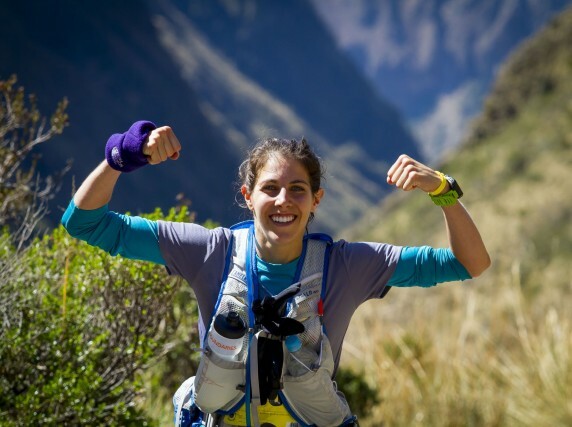 This running vacation offers two epic trail race options, beautiful mountain trail running, and unique adventures and tours in Peru. The highlight of the trip is racing one of the world’s hardest marathons as well as the most scenic South American marathon with the finish line at Machu Picchu! Featured in 2018 in Bloomberg News and the New York Times! 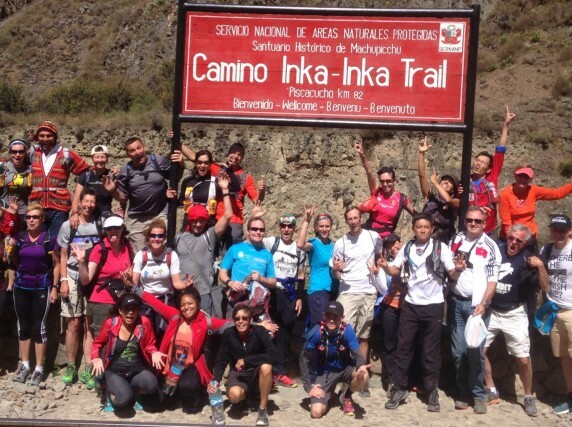 We thought why hike the Inca Trail when you can run the Inca Trail! This bucket list marathon is designed by experienced racers Erik and Myra Rasmussen. 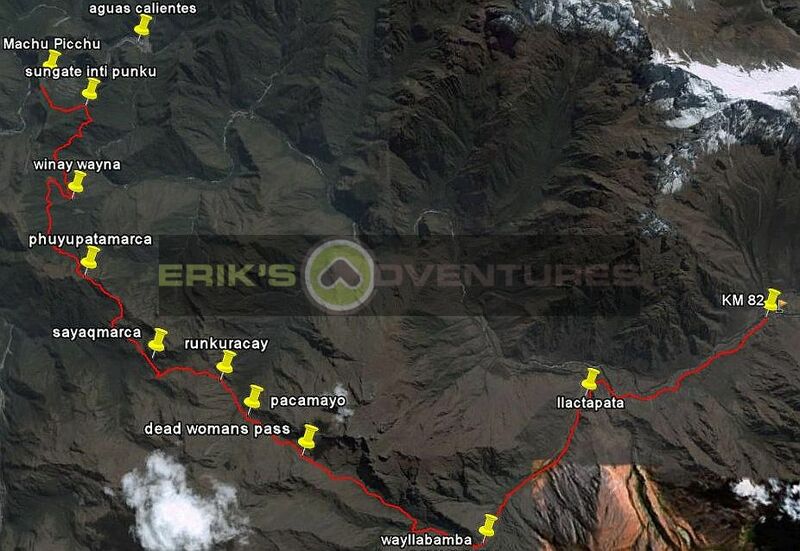 Erik’s Adventures was the first to host an official, accurate, and fully supported 26.2 mile marathon race on The Inca Trail to Machu Picchu. Our 2012 inaugural event featured 41 runners. In 2018 new Inca Trail Marathon Records were set. Join us in July 2020 in Peru and be sure to check out our newest Adventure Marathon- The Kilimanjaro Marathon: The Race to Africa’s Rooftop! 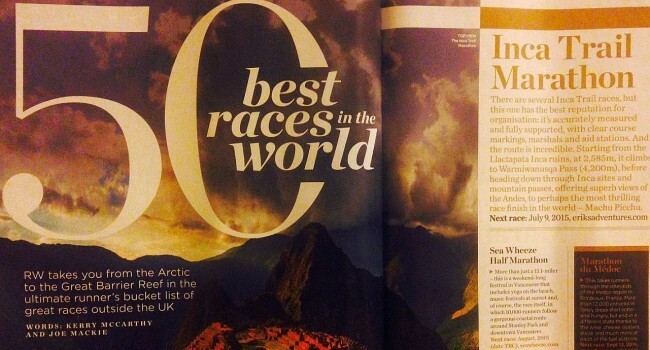 According to various publications, The Inca Trail Marathon is the hardest marathon in the world! We like to say “A Marathon in Distance but an Ultra in Effort”. This race is a highlight for every endurance athlete’s trail marathon calendar! You will be treated to breathtaking views of the Andes Mountains, fascinating Inca ruins, thousands of feet of vertical change, steep ascents and descents, and countless Inca steps. Stay a few extra days and explore the Peruvian Amazon with us after the race with a very unique 4-day Amazon Rainforest Tour. Depart home city and take overnight flight to Lima, Peru. Or arrive earlier and stay in Lima until tour starts on July 4th. Please plan accordingly for a 7:00 a.m.CST arrival (or earlier) into Lima on your own intl flight. Proceed through customs and immigration and check-in for your domestic flight to Cusco which is included and arranged by us. *Please note- If you are already in Lima prior to this morning, having arrived on July 03rd or earlier; please be back at Jorge Chavez (LIM) intl airport to check-in for your flight 2 hours prior to departure. The tour starts with the included flight to Cusco from Lima. Please self-book any services (ie extra night hotel for early arrival, etc) you may want prior to the departure of the flight to Cusco. If you need some assistance or advice, please ask us! Upon arrival in Cusco- You will be met by your trip host and staff and transferred to the hotel in Cusco where you will check in. We will then have a quick meet and greet with your trip host and guides while we taste a Coca leaf tea (traditional Peruvian drink). There will be some time to relax and unpack. Later that afternoon, your hosts and local Cusco tour guides will meet you and take you on a sightseeing guided group tour of the historical center of Cusco, and also some fascinating Inca sites. This tour is specially programmed as an easy day, allowing you the opportunity to acclimate to the elevation of Cusco (approx. 11,200 feet above sea level). Special early welcome dinner included after the sightseeing (this is buffet style and also offers many types of traditional Peruvian cuisine). Here you will also have the opportunity to get to know your fellow travelers and athletes. Overnight in Cusco at Hotel San Agustin El Dorado (or similar). There will be an optional training run this morning led by your trip hosts. All paces welcome. After breakfast at the hotel, we will depart around 09:00 a.m. for Pisac. 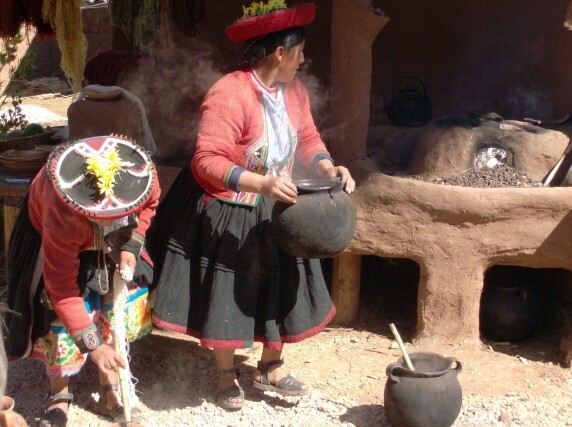 This guided group tour will take you through the Urubamba Valley to the colorful Indian Market of Pisac, where natives from the region of Cusco come to trade their products. We will then proceed to the magnificent archaeological site above this town from where you will witness amazing views of this valley. 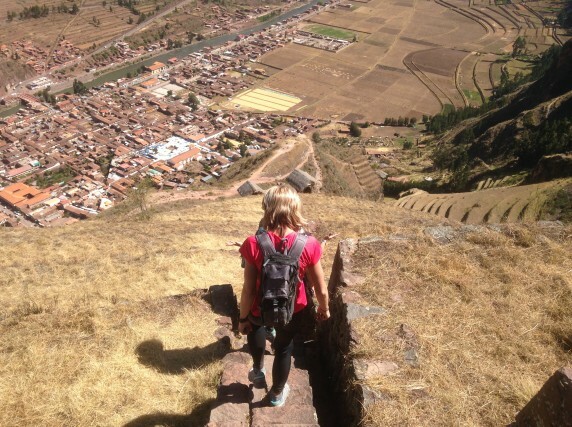 Upon arrival in Pisac, we will have a guided tour of the ruins and then you may either walk for about 30-60 minutes down about 1200 vertical feet to the town of Pisac along an old Inca footpath or take the private transport from the ruins down to the town. In Pisac, you will have a couple of hours on your own to explore the famous Pisac market and to have lunch at one of the many local restaurants. Later in the afternoon, we will return to the hotel in Cusco, arriving around 5:30 p.m. There will be an optional morning running tour in Cusco to visit Sacsayhuaman (Temple of Lightning), located just above the city. All paces welcome. After breakfast at the hotel, we will depart at 09:00 a.m. for a RIVER RAFTING EXCURSION AT CHUQUICAHUANA URUBAMBA RIVER: Always a favorite activity among our trip participants! One of the most popular rafting sections during the season is the “Cusipata” section of the river on the Upper Urubamba. There are great class II and III rapids. After a beautiful 1-½ hour drive, passing through small communities and impressive scenery, we will arrive to the “put in” at the shores of the Upper Urubamba River. Our professional rafting guides will give you a safety briefing and provide you with all the proper safety equipment for rafting. We will be floating for approximately 2- 2 ½ hours, running class II and III type rapids. Afterwards, we will arrive at the “take-out”, where a hot, home cooked lunch will be provided. Showers and a hot sauna will also be available. We will arrive back to Cusco around 6:00 p.m. This is a full day group tour! Please note: If for one reason or another you do not want to participate in the rafting, that’s no problem at all. You will have a free day in Cusco! 9:00 AM MEETINGS: 1 FOR RUNNERS, 1 FOR SPECTATORS. These will be held for race packet distribution, to review the pre-race logistics for racers, and to give spectators finish line information and details. 1:30 PM 3 HOUR GUIDED GROUP TOUR: We will visit Inca ruins outside the city; Sacsayhuaman (Temple of the Lightning), Qenqo (ceremonial place) and Tambomachay (Temple of the Water). The rest of the day is free and at your leisure to relax, shop, explore more of Cusco, prepare and pack for the race, etc. After breakfast at the hotel, we will transfer to Ollantaytambo, located at one end of the famous Sacred Valley of the Incas. We will then proceed on a guided group tour of the ruins and the town, which is commonly referred to as a modern day living Inca city due to the fact that some citizens inhabit original Inca houses over 500 years old. After the tour you will have ample time to explore on your own, take lunch, and relax in Ollantaytambo. 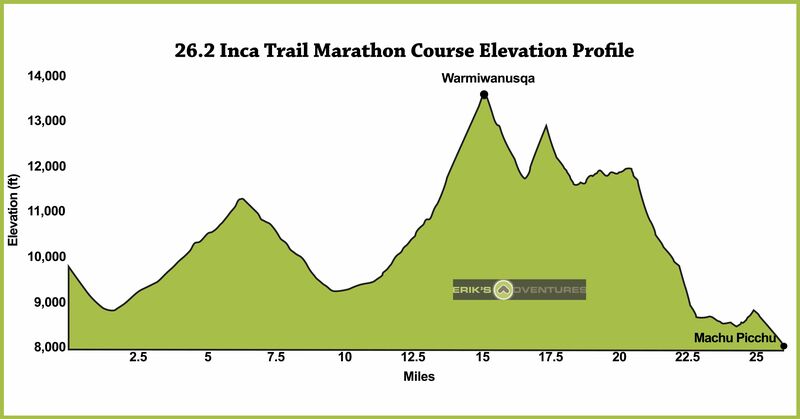 Day 6 THUR JULY 9: OFFICIAL 26.2 MILE INCA TRAIL MARATHON AND 18 MILE INCATHON! Spectators: Breakfast will be provided at the hotel. 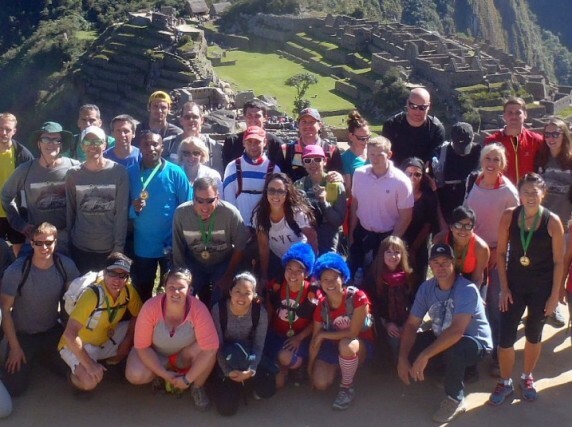 Your trip host will coordinate this day with you on-site, and you will have the morning free (options include day hikes, shopping, thermal baths, coffee shops, etc), then you will proceed up to Machu Picchu to visit the ruins and see the racers running the Inca Trail right to the finish line. *Please note: For everyone, the last bus down to Aguas Calientes from Machu Picchu leaves at 5:30 PM. Machu Picchu closes at 5:30 p.m.
Post race- Runners in both trail race events will have the opportunity to reunite with spectators, head down to Aguas Calientes whenever you are ready, change/refresh at the hotel, do some celebrating with the group, and relax in the evening. After an early breakfast at the hotel, we will take the morning bus up to Machu Picchu. Guided group tour. For those willing to get up extra early, you can arrive in time to witness the sunrise over this majestic place. Any 2-day finishers will eat a hardy breakfast at camp and complete the race. You will arrive to Machu Picchu this morning and finish the last portion of the Classic Inca Trail and this classic pilgrimage to Machu Picchu. 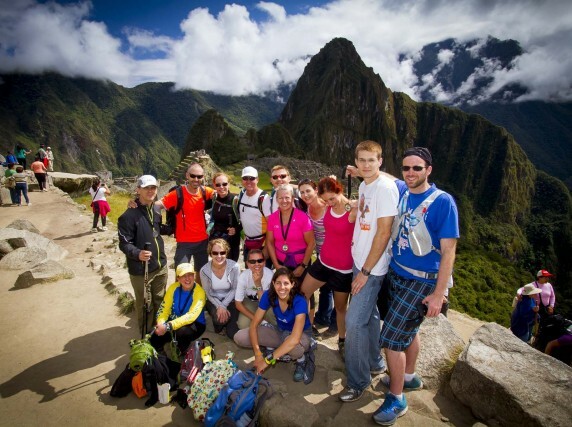 You will met by the rest of the group at the finish line at Machu Picchu celebrating your accomplishment! For all trip participants, we will have a guided tour of the complex with our local guides (approx. 3 hours). Later, there will be several hours available to spend as you choose in this unique archaeological site, allowing ample opportunities to explore on your own. The rest of day will be free in Machu Picchu and Aguas Calientes. Bus back to Aguas Calientes town included. In the evening, all race participants (26.2 marathon and Incathon) and spectators can proceed to a special included group dinner in Aguas Calientes to celebrate! Results and awards will be presented at dinner (exact time TBA). After breakfast at the hotel, we will all depart via a morning train to Ollantaytambo. We will then take private transport to Cusco, stopping along the way at a scenic viewpoint for photos of the Urubamba mountain range. Afterwards, we will arrive to Cusco and check back into the hotel. Lunch on your own. Rest of day/evening at leisure for shopping, sightseeing, and relaxing. That evening, we will meet in the lobby at 7:15 p.m and take a short walk to a famous restaurant in Cusco for an included farewell group dinner and cultural show. This will be a great chance to sample more Peruvian cuisine, experience more music and culture from the Andes, and socialize with fellow travelers. Breakfast at hotel. Morning transfer to Cusco airport. Fly back to Lima from Cusco. Please book your flight home from Lima for a departure after 12:30 p.m. July 12, to ensure you make your connection. Please note- All times for tours, transfers, daily arrival/departure times, etc. are approximate and subject to modification at the guide and/or host’s recommendations. Erik’s Adventures reserves the right to alter the itinerary if necessary due to safety concerns, circumstances outside its control (i.e. worker strikes, weather, government, etc.). During the portion of the trip on the Inca trail (including the race), which is controlled by the Peruvian government, we reserve the right to make changes if needed for passenger safety, changing or new government regulations, and other concerns. Hotels mentioned are subject to availability. We may use hotels similar to the ones mentioned in the itinerary. The 2020 Races will be on Thursday 7/9/2020 at 4:00 AM for the full marathon and 0500 AM for the Incathon. These start times maximize the time you have to complete the race while minimizing the amount of time you must run before it is light out for safety reasons, and of course to better enjoy the amazing scenery. Every runner in our races will finish right at Machu Picchu and complete the entire Inca Trail in the process. To complete the race at Machu Picchu in one day and get down to town before bus services end, you must finish by 5:15 p.m. Machu Picchu does not allow entry past 5:15 p.m., nor are there anymore buses down to Aguas Calientes after 5:30 pm. **This is a regulation imposed by the government entity that administers and controls Machu Picchu and the Inca Trail (subject to change). All people on the Inca Trail must adhere to this rule, no Inca Trail users or tourists are allowed to enter Machu Picchu at night. Can I complete such a tough race? We think so! Our staff will be out there to support, but it depends on you. Things that will help you: If you are a good endurance athlete, a strong and/or experienced runner, avid marathoner, someone with good trail running knowledge, experience running ultras, other long course (ie Iron distance tri) background, a strong mountain hiking background. Having some of these traits will be helpful. In addition- If you train hard, safe and smart for this event, considering some of our training suggestions, then we feel you will accomplish this feat! The willingness to try it is the first step to the finish. Your safety is our 1st concern for this event, please follow our guide and RD instructions. It is not possible to participate in the races without camping out the night before near to the start line. Start line: Faster runners should seed themselves to the front. Official times will be recorded to gun time. All Inca Trail runners will wear a numbered bib at all times (for tracking, splits, and safety reasons). Packet pickup and a mandatory pre-race meeting will take place 2 days before the race. 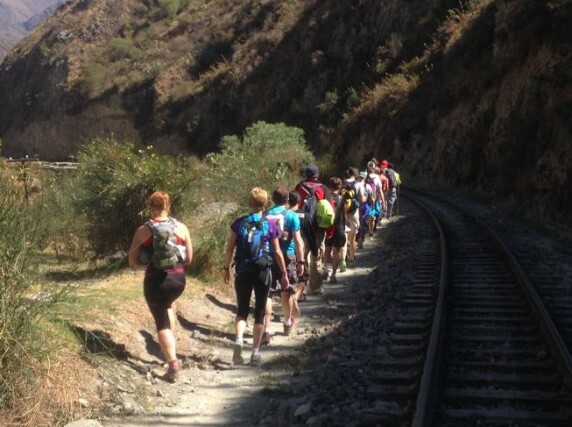 It is not permitted to litter while running the Inca Trail. Please keep the trail clean and throw garbage away at aid stations. A total of at least 4 aid stations will be available for the race. Purified water, and some snack foods such as dried fruit, mixed nuts, pretzels, small avocado and chicken sandwiches, cookies, chocolates, coca, etc will be provided at these checkpoints. You must pack your own nutrition and carry it with you the whole time if you want anything different than these types of items. *Please note: Due to the distance (in some cases a couple of hours depending on your pace) between aid stations, you will be required to carry your own fluids and nutrition, and some emergency gear (i.e. in a day-pack) for your personal safety. You will have the opportunity to refill water/fluids at aid stations as needed. *Aid station locations can be moved at the race director's discretion depending on race/trail conditions. First aid will be available at all aid stations. English and Spanish speaking staff will be available with long range radio communication and satellite phones for emergencies. Upon arrival at the aid stations, your bib number and in some cases your arrival/departure time will be recorded. We will provide you race splits from key points on the course. All participants receive a custom tech Inca Trail Marathon race shirt, goodie bag, other items, and race medal. You will also be given a custom logo Inca Trail Marathon drop bag by us to pack for this race. You may keep this after the event. Detailed race splits are provided in the race results. Runners in both trail race events will have the opportunity to reunite with spectators, head down to Aguas Calientes whenever you are ready, change/refresh at our host hotel, do some celebrating with the group, and relax in the evening. The next day in the evening, all race participants (26.2 marathon and Incathon) and spectators can proceed to a special included group dinner in Aguas Calientes to celebrate! Initial results and race awards will be presented at our very last group dinner back in Cusco on the last night of the trip along with live music and a folkloric dance show! Although you should be prepared for a variety of weather conditions (i.e. wind, rain, heat, cold, fog, snow, hail, possible rapid changing conditions in the mountains), the typical weather conditions for July on the Inca Trail range from 80°F for the high and 32°F degrees for the low. Average rainfall is only about 3 days/month. Temperatures vary substantially with elevation changes. For example, at Dead Woman’s Pass, you can expect approx. 40°F temperatures, while at Winay Wayna; you can expect daytime temperatures to reach approx. 75-80°F. Please plan accordingly and be properly prepared for any type of weather! Your safety is our first priority. The following items are some of the gear you will want/be required to have- this list is not all-inclusive. Due to the varied elevations and temperature changes you will experience while running on the Inca Trail, we suggest planning your running wardrobe accordingly. Drop bags will be made available at our second camp if you do not make the cutoff. Do you need assistance putting a training plan in place that meets your individual needs and will prepare you for the Inca Trail Marathon? We offer comprehensive custom coaching and training plans from one of our certified coaches to help you prepare (extra charge, inquire for details). While Inca trail conditions are generally good, it is a hard trail. Many steep trail sections require very careful footing. The trail is mostly Inca paved stone (irregular stones of all shapes, sizes, textures laid out in a 4-6 foot wide path). There are also some dirt sections and places where the trail surface is uneven and rocky. You will encounter steep stone steps and narrow passes with steep drop-offs to one side. The Inca trail is generally at least 4 feet wide. Conditions become slippery with rain and moisture, especially on the descents in the cloud forest, so please use caution. The Inca Trail cannot be closed to other hikers, so you will encounter other hikers (and porters) while running on the Inca trail. It is easy to get around other runners and hikers, as there is ample width on the trail. Please be courteous and clearly announce that you are passing them, allowing them enough time to clear the path. This has never been any issue at all in our events and in fact the other groups are usually very encouraging as they become aware the race is going on. You may get cheered along by them, so its actually good fun interacting with some of the other groups and porters. You are unlikely to encounter any hikers on the first and last legs of the race due to the time of day. 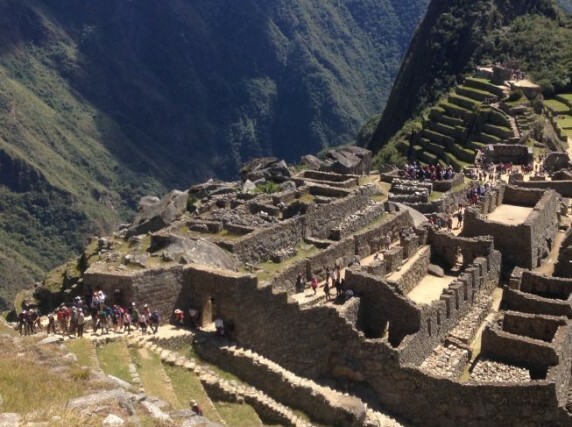 To insure you finish at Machu Picchu by 5:15 p.m., there will be a national park mandated mandatory cutoff prior to proceeding onto Machu Picchu towards the last part of the Inca Trail. This is normally 3:30 pm and set by the Peru government regulatory body that administers the Inca Trail operations. **Please note: No tourists at all are allowed to proceed after these times or they will be arriving too late to Machu Picchu and it will be closed with no bus service to get down to the town. It's definitely worth the wait because you will still finish the race at Machu Picchu (the next day) instead of an alternate finish that is not at Machu Picchu. No matter what your race time, we strongly believe one of the best highlights of the Inca Trail Marathon is to finish right at Machu Picchu for that once in a lifetime spectacular photo finish and also to be able to complete the entire Inca Trail in the process. So, if you miss the cutoff, you will spend the evening comfortably at our specially staffed 2nd campground. The next day you will finish the remainder of the Inca Trail and racecourse, passing through the sun gate and ending at Machu Picchu. You will be welcomed by our spectators and other runners who will be celebrating your accomplishment! Do not despair for even a moment, because if the Official 26.2 mile race course was easy, we would not need a cutoff and everyone would be doing it! During your stay, you will have access to some of your personal items (pre-packed by you in a provided drop bag and brought to the checkpoint by our staff- see below for suggested gear). You will have tented accommodation with a sleeping bag, and meals. Our support staff will also be onsite. Note: 2-day finishers receive official finish times- published in all results online and elsewhere, and receive the same finisher medals, awards ceremony, etc. This adventure marathon is designed by experienced runners especially for racers. All runners will finish at Machu Picchu in this race! The route is professionally measured, well marked, and supported with at least 4 well stocked aid stations. 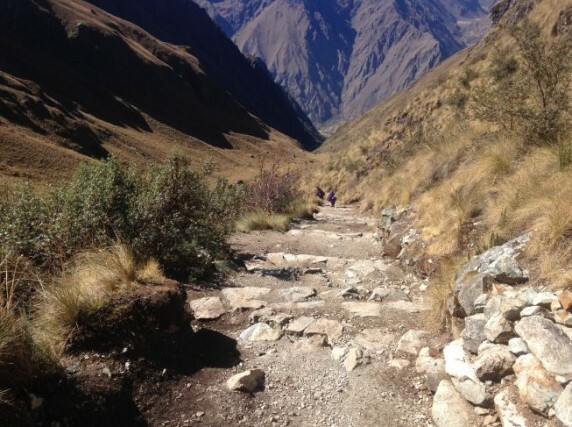 Our custom designed marathon race course is longer than the one way distance of the Inca Trail. We have first-aid available at various locations and plenty of course marshals and race officials out on the race course. This is one of the world's most difficult marathons! The course takes the typical hiker 3.5 days and ascends multiple mountain passes, reaching a max elevation of 13,800 feet. You will be treated to breathtaking views of the Andes Mountains, fascinating Inca ruins, thousands of feet of vertical change, steep ascents and descents, countless Inca steps, and a photo finish in front of Machu Picchu; one of the New 7 Wonders of the World. According to various publications, The Inca Trail Marathon is the hardest marathon in the world! We like to say "A Marathon in Distance but an Ultra in Effort". This race is a highlight for every endurance athlete's trail marathon calendar! We also offer a shorter race with all the full course benefits that will allow runners of all abilities to compete and run on the Inca Trail all the way to Machu Picchu! The specially designed trail race course is is an abbreviated distance of the full course. The route offers all the difficulties and amazing highlights associated with the last two thirds of the 26.2 mile course (see elevation profile chart). Due to the shorter distance, the course allows our racers more time to reach Machu Picchu, making this race well suited for people with a bit less trail running experience. The 26.2 mile Inca trail run begins from the start line at 4:00 am. The first portion of the race features some pretty runnable smaller ups and downs, followed by a steady ascent for a couple of miles, and then a runnable descent passing by the river again at the aid station at Wayllabamba. The 16 mile Incathon starts at 0500 am in the same place as the 26.2 race. It takes a more direct route to Wayllabamba and is the same course description below as the 26.2 course from Wayllabamba onward. From our aid station in Wayllabamba area, runners on the Inca trail begin a very steep climb all the way to Warmiwanusqa (Dead Woman’s Pass). This change of altitude means that racers running the Inca trail will pass through three separate ecological zones during the day: Quechua, Yunga and Puna (from valleys with trees, through high pastures, to arid grassless areas short of the snow line). The tough and steep ascent of roughly 1,250 meters to the first pass from Wayllabamba showcases magnificent views and challenges all experience levels of trail running. Descending rapidly from this superb vantage point, Inca Trail runners will pass scenic waterfalls before arriving at Pacamayo, the next aid station. **Very steep descent that is very difficult to run down fast. Please be careful! From Pacamayo, climb again to the 2nd pass of Runkuracay to see an ancient Inca watchtower. **Another climb up mostly stairs, very steep grade. The descent from Runkuracay includes passing by the Inca ruins at Sayaqmarca (a small maze-like ruin built above a sheer cliff). ** Another steep descent with a mix of stone stairs and irregular stone trail. 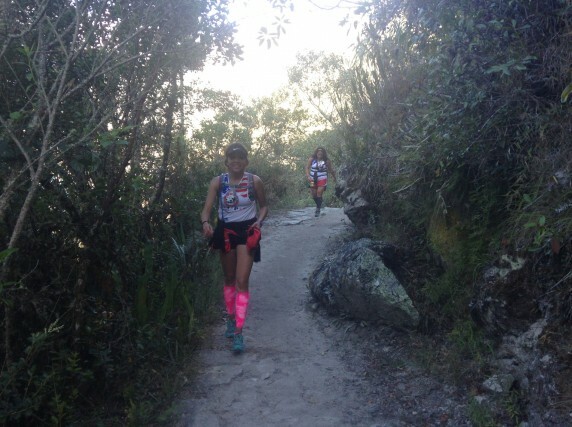 Passing through a rock tunnel on a relatively flat section of the trail, racers will reach another aid station at Phuyupatamarca (city above the clouds) which contains a beautiful set of linked stone baths still supplied by mountain streams. From here, racers should see Mt. Salkantay (6271 meters), a very sacred peak to the Incas. ** A much more moderate climb compared to the first two passes, featuring a more rolling profile on mostly irregular stone trail and somewhat easier to go faster in this part than previous sections. The descent down from Phuyupatamarca to Winay Wanya is a nearly continuous set of steep Inca steps (over 2,300), passing through the cloud forest and ending at the impressive ruins of Winay Wayna, (the final checkpoint). **Very steep descent mostly irregular stone stairs, and not really very runnable except for people with great footing and lots of trail experience (it can be amazing to watch some of the porters working on the Inca trail run down this with heavy gear). Can also be very slippery here. Please be careful! The next portion of the course is flatter with occasional rolling terrain through tropical vegetation. The final ascent to Intipunku (the Sun-Gate) includes one set of very steep steps and is where Inca Trail runners will catch their first glimpses of Machu Picchu (2,400 meters) below. After taking in this memorable view, the trail descends about a mile to the Inca citadel of Machu Picchu for a once in a lifetime race finish near the watchtower. This landmark presides over Machu Picchu and offers the famous postcard view of the Inca city that will serve as the backdrop for your Inca Trail marathon finish. 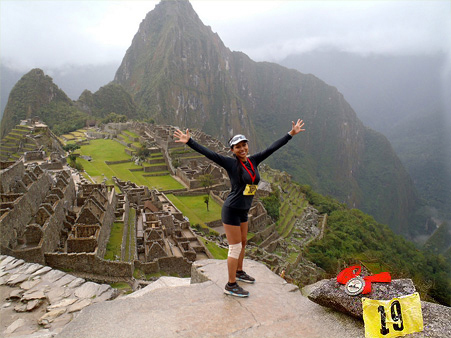 All our finishers can complete the marathon at Machu Picchu for that once in a lifetime photo finish! After many years of operating adventure tours in Peru on the Inca Trail and serious involvement in endurance sports, Erik's Adventures decided to organize a professional, fully supported, standard marathon distance length race on the Inca Trail in 2012; which was the first official 26.2 mile race on the Inca trail and is currently rated one of the most difficult marathons in the world. The course for this race has been specially designed and professionally measured to 26.2 miles. It is longer than the one way distance of the Inca Trail from KM 82 to to Machu Picchu. In years prior to 2012- Inca Trail runners have successfully completed challenging runs on varied distances, most commonly from KM 82 to Machu Picchu (less than 26 miles), or from any one of the organized Inca Trail camps directly to Machu Picchu (much less than 26 miles). Times for these distances have ranged from the fastest recorded time of a little under 4 hours from KM 82 to Machu Picchu by an Inca Trail Porter to the fastest time to date for our specially designed Original 26.2 mile Inca Trail Marathon course- 6:33 by our winner in 2015, Mick Clifford. Whatever the distance run or the time achieved, the Inca Trail offers runners a once in a lifetime experience. With Erik's Adventures running adventures, you too can add your name to this elite list of Inca Trail runners and become a true Chasqui! All photos we get of you during the race from our race directors, photographer, and course officials will be available to you free of charge. Single room supplement: For runners and spectators, please add $599 for a single room throughout the trip (for runners this will also include a single tent for the camping night before the race). Have some extra vacation time? Explore the Amazon Rainforest with us after the race! -Tourist Train/Bus return from Aguas Calientes / Ollant./Cusco-seats reserved. -Meals not mentioned on the program. 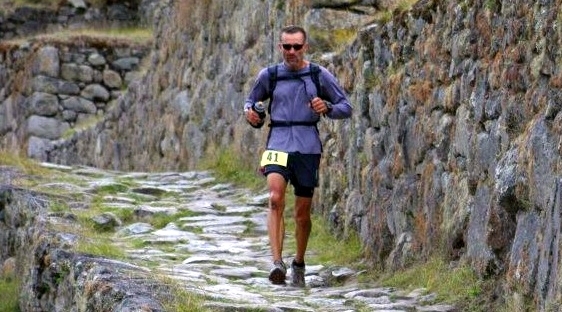 Official 26.2 mile Inca Trail Marathon and Incathon Trail Race Results. Congratulations! All Runners did a great job by finishing at Machu Picchu! New course records were set in 2018 by Danielle Leerson with a ladies all-time best time of in 8:01:04 and also Liang-Nan Chen (Michael the Legend) by completing the Incathon course in one day at 75 years of age young (our oldest competitor in race history)! Erik and his entire team worked very hard to make everyone's individual experience a great one. The aid stations are plentiful along the course. A picture cannot capture the true beauty of the breath taking views encountered not only at each summit but throughout the 26.2 miles. This race attracts not so ordinary runners, each amazing and inspiring, willing to give 100%. Couldn't have shared this experience with a greater group of people. Five stars all the way around! 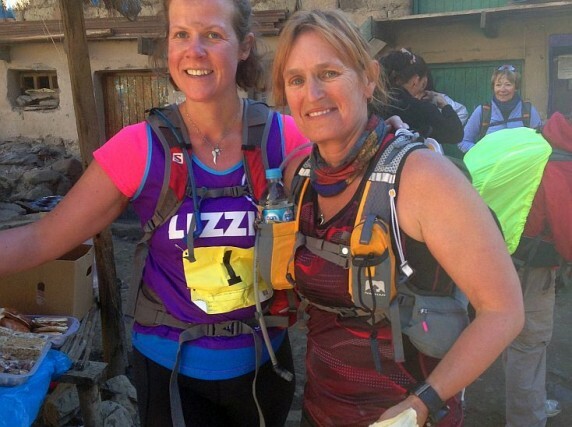 Coordinating a marathon on the Inca Trail is a herculean effort. 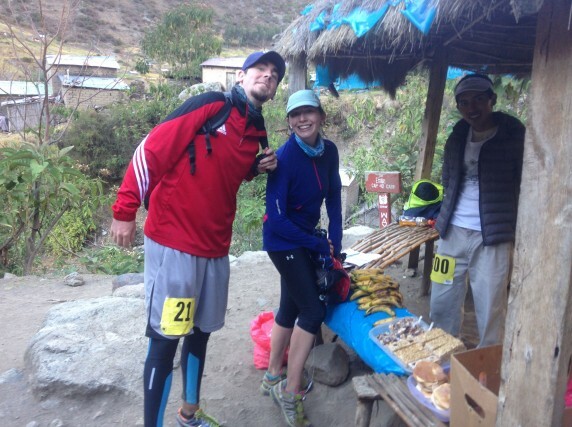 Erik's has a great relationship with Peruvian guides and porters; he put on a race that could not have been better! Erik is totally focused on your safety and success. You will run the Inca Trail in one day. Most Trekkers take 4-5 days doing it. Awesome finish at the top of Machu Picchu, with a spectacular view. I was the last finisher in one day this year and all the other runners were there to cheer me in, some waiting 5 hours (don't plan to BQ here:). My daughter joined me as a 'spectator' and had just as good of a trip. Well worth the price! The course is as difficult as any in the world, but the views are breathtaking and people are great. The organization is as good as it possibly could be. Its a race where you will have to rely on yourself, but Erik and his crew will definitely get you through it all. This was such an unforgettable and life changing experience. One of the Best Adventures I have ever had and my favorite Marathon EVER. I will def. do it again. Its the mixture of the demanding elevation profile, the high altitude, the breathtaking views on the course and finally the finish line in Machu Picchu which makes this race a unique experience! Erik and his team did a great job to support us with a perfect race organization and personal attention to bring everybody healthy and safe behind the finish line. For people fond of trail running and mountain races a MUST on their bucket list! This was my 6th continent. I came to Peru having just climbed Mt Kilimanjaro & run a marathon there. Plus I had run the Great Wall a month before that. Both of those were great experiences, but this is, by far, the toughest race you'll ever love. I can't thank Erik & Erik's Adventures enough for taking care of every detail. The planning and execution were beyond my expectations. Erik thinks like an adventure runner because he is one. From start to finish, this was a phenomenal experience. Thanks to Erik, I'll forever think of myself from here on out as a Chasqui...an true Inca Runner!! Erik exceptionally organized a fabulous tour of Peru with a range of great activities seeing the ruins, white water rafting and ultimately a fantastically coordinated marathon on the Inca Trail. Running this was a mental and physical challenge over many hours but so rewarding with stunning scenery and satisfying to complete at Machu Picchu. Aid stations and support were perfect in difficult conditions along the trail. An amazing event!